At Naper Auto Works in Naperville, IL, our ASE Certified technicians have provided superior auto repair in Naperville since 1977! We offer maintenance and auto repair in Naperville for every make and model of domestic and import vehicles, so no matter what you drive, you can count on us to get you back on the road quickly and easily. 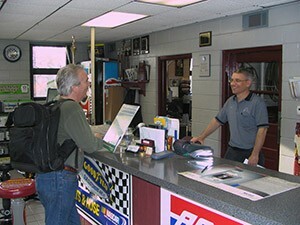 Our team members respect and appreciate each one of our customers, and promise to never try and sell you unnecessary services or inferior parts. Every suggested auto repair is fully explained, along with the expected cost and completion time, so there are no surprises at the end of your visit. When you bring your car in Naper Auto Works, you can trust you’re getting the best auto repair Naperville has to offer! At Naper Auto Works in Naperville, we perform the complicated auto repair that other shops can’t. Our Naperville auto repair technicians are experts in transmission repair, emissions, alignments, and everywhere in between. We are also fully equipped with all of the proper tools and parts necessary to service specialty vehicles. We are always drivers’ first choice for Hybrid repair in Naperville, as well as the number one choice for fleet repair and small to medium sized commercial truck repair. Don’t bring your vehicle to just any mechanic. Trust your car with the automotive technicians with the expertise and resources to give you the best auto repair in Naperville at Naper Auto Works! From automatic to manual transmissions, differentials to clutch replacement, our expert technicians are guaranteed to satisfy all of your transmission repair needs! Your Hybrid requires speciality parts and accessories unique to Hybrid vehicles. At Naper Auto Works, our technicians are experts in Hybrid repair. Our auto repair shop is fully equipped with the latest Hybrid technology and tools to properly service your vehicle, so you can get the most our of your Hybrid! We offer the sale, installation, rotation, and balancing of all types and sizes of tires. Our tire experts can help you find the tire best suited for your car and lifestyle, so your vehicle can perform at its absolute best! Proper alignment can help improve your vehicle’s gas mileage, and lessen your tire wear, while giving you the smoothest ride possible. Whether you have two-wheel drive or four-wheel drive, our expert auto repair technicians and state-of-the-art alignment equipment will have your car balanced and running like new again in no time! From catalytic converters to damaged clamps, our experts can help with all of your exhaust needs! Give us a call today and find out why drivers chose us first for all of their maintenance and auto repair in Naperville, IL!